Do you have the task to organize a business meeting, training session, multi-day conference or kick-off meeting? Hampshire Hotel Emmen is happy to take care of everything. Our rooms are for 2 to 2,500 people and can be equipped with all modern audiovisual equipment. We offer standard meeting packages or, together with you, create a tailor-made program including the culinary interpretation. The Hondsrugzaal and the Vlinderzaal form the professional setting for a conference. Through furnishing and lighting these rooms get the atmosphere you want. Whether it is a meeting with VIP reception, a conference with sub-rooms or a presentation with separate stand construction. And do you want to sit apart with a smaller group? Then choose Heerenkamer, Tacuma, Heide, Compas and / or Disselzaal. A business meeting with a smaller group? 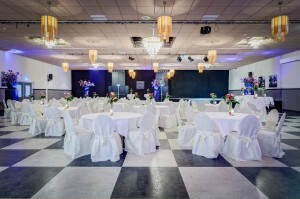 Our banqueting staff will gladly help you with the details in advance. We prepare our rooms in the most ideal setting, including the tools you want. You want to train or meet with a small group? Take advantage of our inexpensive meeting packages. These provide for example in room hire, lunch, dinner or overnight. Is the group a bit bigger? We will be happy to advise you! You want a meeting that employees or colleagues are talking about for a long time? We combine our indoor meeting and sports facilities with the outdoor activities that suit your group. A trip across the Drenthe Heath, water skiing, or perhaps a visit to the sharks? Our team is ready for you!